Credit: Mark Lopez/Argonne National Laboratory. We all know about oxygen. It is a chemical element, which is a member of the halogen group on the periodic table. It has atomic number 8 and known by symbol ‘O’. It is extremely reactive non-metal and oxidizing agent that quickly forms compounds with most elements. After hydrogen and helium, oxygen is the third-most abundant element in the universe by its mass. At room temperature and pressure, two atoms of the element bind to form dioxygen, a colorless and odorless diatomic gas with the formula O2. Diatomic oxygen gas constitutes 20.8% of the Earth’s atmosphere. Although, oxygen levels in the atmosphere are trending downward globally, possibly because of fossil-fuel burning. The configuration notation provides an easy way for scientists to write and communicate how electrons are arranged around the nucleus of an atom. This makes it easier to understand and predict how atoms will interact to form chemical bonds. It shows the arrangement of electrons around the nucleus of an atom. It also helps chemist understanding how elements form chemical bonds. Scientists found a new way so that they can use a small electric current to introduce oxygen voids or vacancies that artificially change the conductivity of thin oxide films. This research is done at the U.S. Department of Energy’s Argonne National Laboratory. This research can help us to know about working with these materials. It is also can be used in novel electronic devices, catalysts, etc. Scientists are always in search for the amazing behavior of material so that new technology can take place. Oxides can collect much interest towards itself because sometimes they display properties of such amazing behavior. The properties are like, jumping between insulating and conducting states, switching on and off magnetism. Sometimes they become superconductive like without any loss or heat, they conduct electricity very well. Scientists thought they should apply some of this property to oxygen vacancies. The structure of an oxide is a repeating crystalline lattice consisting of oxygen atoms spotted around it. But, sometimes, there may be a gap, where an oxygen atom is absent. This picture shows a new system designed by Argonne researchers consisting of indium oxide and yttria-stabilized zirconia layers. 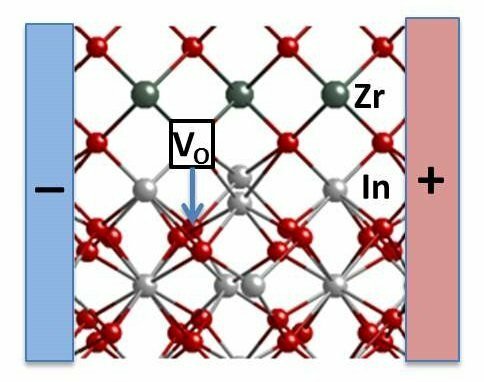 They found that when they applied a small electric field in a horizontal direction, between the “+” and “-” regions, some oxygen vacancies move vertically from the yttria-stabilized zirconia into the indium oxide. This causes its electrical conductivity to increase substantially and could be useful in electronics or catalyst applications. Zirconium ions are shown in green, oxygen ions are red, and indium ions are silver. Credit: Jeff Eastman/Nature. With substitute method, the Argonne team wanted to find out if they could control vacancies. Scientists have constructed a two layer material: an indium oxide crystal layer on top of a block of Yttria-stabilized zirconia. (Yttria-stabilized zirconia (YSZ) is a ceramic in which the crystal structure of zirconium dioxide is made stable at room temperature by an addition of yttrium oxide. These oxides are commonly called “zirconia” (ZrO2) and “Yttria” (Y2O3), hence the name). After that, researchers applied small electric current. Due to this, they watched electrical conductivity soar by two orders of magnitude. It is on the boundary where the two layers meet. The result is very unpredictable: it goes back to its original, less conductive state without the current. 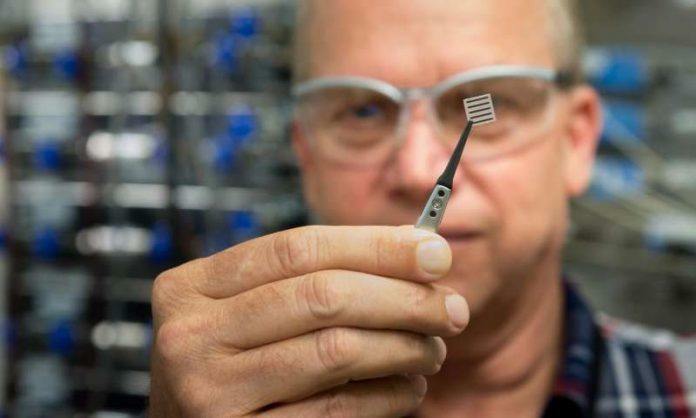 According to scientists, it could be useful in electronics or building catalysts, such as providing a way to split water or carbon dioxide. The theory, supported by computational modeling, is that the difference between the two materials’ properties creates an upright voltage between them. The negatively charged oxygen ions in the indium oxide are made attention to the flow and turns beyond the interface by leaving vacancies backward. Scientists are investigating either the same effect occurs in other materials or the method could control other properties. Scientists used beam- line 12-ID at the Advanced Photon Source, a DOE Office of Science User Facility, for characterization and analysis. The also used Fusion cluster at the Argonne Laboratory Computing Resource Centre in evaluating the theory developed.